To edit your ad, login to your Daft account. 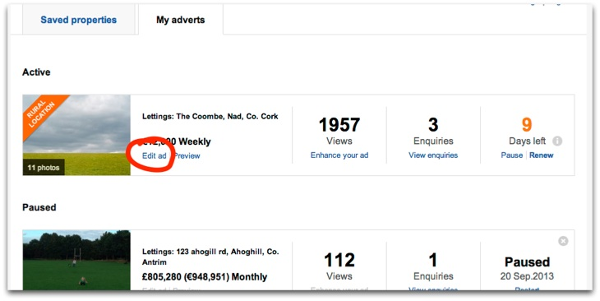 You will be brought to the 'My adverts' tab within your account. Under the 'Active ads' heading, you will see your ad. Underneath your properties address, is the 'Edit ad' option. Edit your ad accordingly and once you've made your changes, click on 'Save' at the bottom of the page. Apart from sales ads, editing your ad it moves it up the search results page as it automatically renews it. It will only move up if it has not been renewed in the last 24 hours. If you fail to renew your ad before it's expiry date, it will be paused and placed under your Paused ads heading. It will remain here for 30 days before becoming an 'Archived ad'.